For the past six years the contest has recognized the best of the best in Latin America’s digital industry, with nominees chosen by a jury in 35 categories focused on electronic commerce, social media and entrepreneurship, and digital marketing and tourism. The digital campaign “Riviera Nayarit 10 Years – Top 10” was launched in 2017 as part of the celebration of the 10th anniversary of the Riviera Nayarit brand. Every week for 12 months the destination published lists of 10 recommendations for hotels in the area, hotspots, beaches, and all the attractions offered by Mexico’s Pacific Treasure. The campaign was nominated on June 30th under the Digital Tourism category and went on to become a finalist on July 6th. Public voting opened up on August 1st; the award is sponsored by Interlat, a Latin American web-based business school, and Hootsuite, one of the top social media management platforms around the world. Voting will be open through August 12 at 11:59 PM. Winners will receive their awards on August 24th during a gala dinner in Bogota, Colombia, which will be streamed live on its official page. The jury is made up of experts including Matthew Finch-Noyes, Value Manager for Hootsuite; Miguel Sánchez, Account Executive for Hootsuite; Rob K. Srivastava, Digital Director at TINT; and Stacy Robinson, Customer Success Manager for Zerofox. 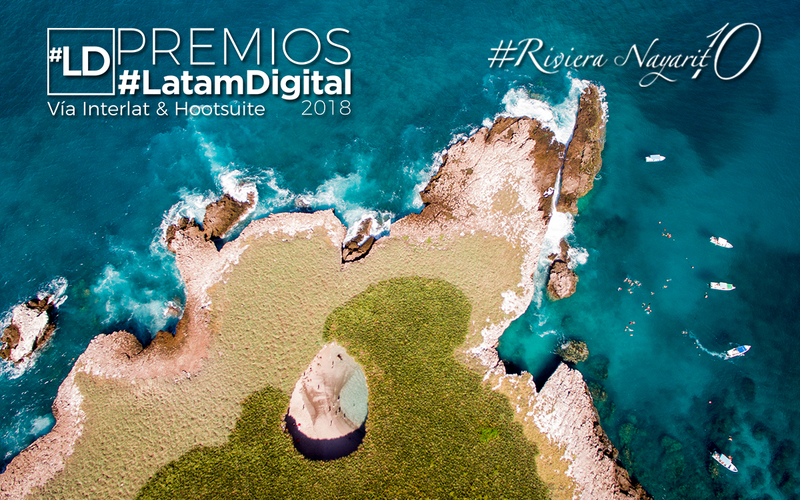 “Riviera Nayarit 10 Years – Top 10” is competing against three other finalists: Gobernación by Santander, Colombia; ADS Web Market S.A.S. (San Andres Islands) and Feria by Cali.